Happy TGIF to everyone, I have been log out of my laptop for three days without blogging as my laptop has infected virus. 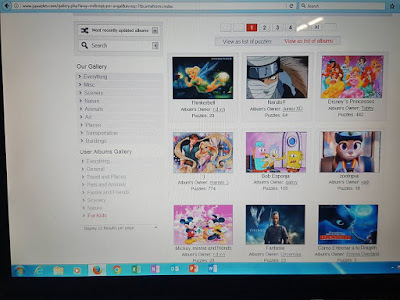 I am glad that I am back blogging today as I have got so much to blog and share with you. I have waited hours to tell you that there's a website where you can sign up an account and register for free to use play the JSPuzzles online. 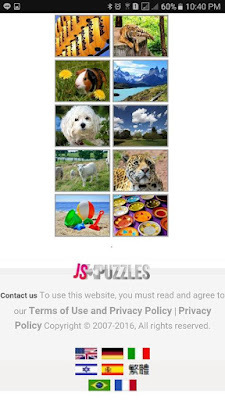 JSPuzzles is an online jigsaw puzzle that you can play daily because they have new jigsaw puzzle everyday. 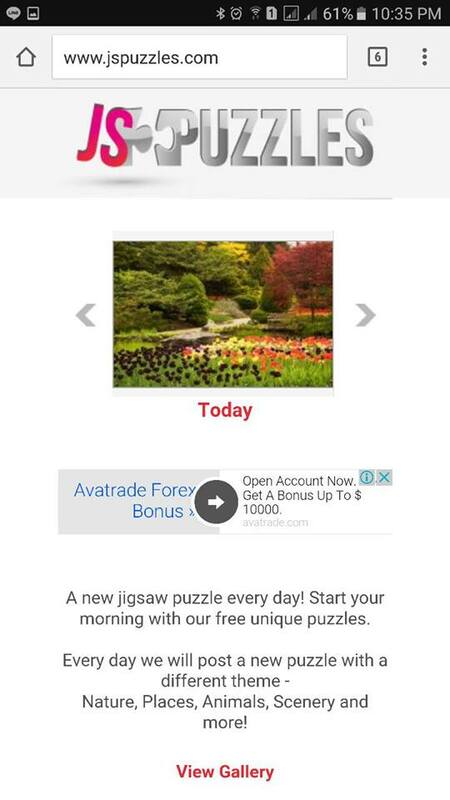 That's not all, you can sign up an account there to upload your own puzzles. 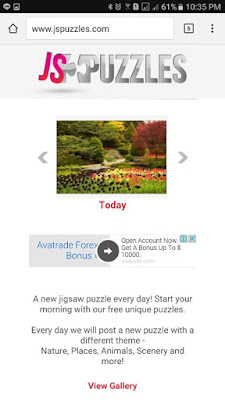 You can view everything related to jigsaw puzzles from the User Album Gallery. Take a look at the photo below where I have used my photo of me and my son with a clown where we had a great time at Resorts World Genting. I want to make this fun and memorable, I can play with this puzzle in various pieces to choose from. For your information, it's free to sign up an account at the website. You will need to type in your prefer User Name and password to register. It's fun to play as we can play the puzzle to see our score online. 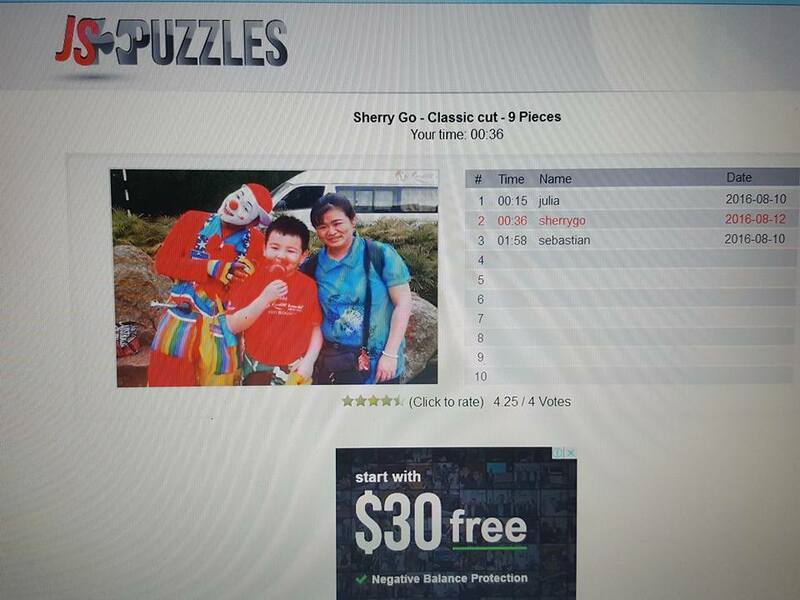 I tried the 9 pieces and find out that I am 2nd in the list for now. Who knows who is going to beat my timing next. It's fun activities with children, they can play together. You can choose to play the photo in 9 pieces or up to 225 pieces. I find out that most people prefer to play 25 pieces of the jigsaw puzzles for this photo. It's good for our memory and mind too, everyday there's a new puzzle to play. You can start play with the exclusive free puzzle. The new puzzle can be in any theme namely nature, places, animals, pets, landscapes and many more. I know my friends have got pets and they love to take photo of their pets fish, dog, cat, snake, hamster or iguana. 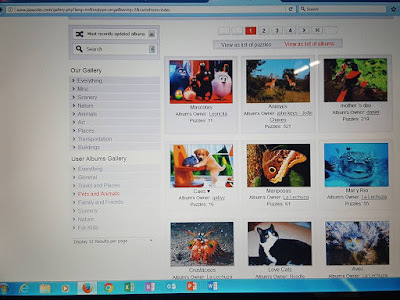 It's good to share with them about this website where they can upload their pet photo to make jigsaw puzzles, save and download their puzzles. Now you don't feel bore or feeling you have nothing to do during free time, you can start planning on what photo you like to make jigsaw puzzles. Thanks for the info! Looks like I got new things to keep me occupy when I bored!! you are welcome, go ahead try them out whenever you are free. Nice!! I love jigsaw puzzles too! Good to get one as a present for kids as well! yeah it be nice for them, you can also play it online everyday. Jigsaw puzzles are never my thing. Haha. I don't have to the patience to find the pieces and put them together. LOL! But I'm sure kids would love this - a good way to spend their free time. yeah need time break for education, can play this online with kids. I am sure my daughter would love to play this. Fun and educational. Thanks. Your customised puzzle is so nice. I want to do it too with my kids. I used to play jigsaws like these online a long time ago. Never found the time to do so since I started working! This is too cool. Perfect birthday present too. Maybe I should get one for my anniversary, will be sweet to do a puzzle together. Owh! been looking for this kind of things to play. Great for past time and can do brain work out. My younger sister love jigsaw puzzles a lot! Can let her know about this. I love to play puzzles!! !Puzzles can train brain as well!! I can do this jingsaw puzzle as a gift. The best part they can customize the jingsaw puzzle. This website is fun for people who like to play jigsaw. 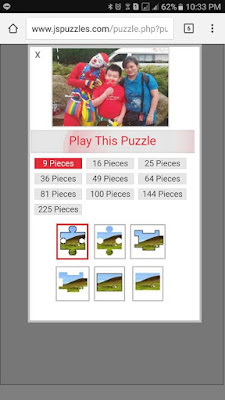 Plus we can upload own photo to create jigsaw too! Wow.. online Jigsaw puzzle. Interesting and fun for kids to play. Love puzzles when I was younger! Brings back memories ! it was good that we can customised our photo into a puzzle ! The puzzle recall my memory while playing the puzzle until midnight.